Is there any gemstone more friendly to the artisan’s hand than Baltic amber? The versatile beauty of Baltic amber is matched by none as far as we can tell. The gem that seems to come closest in terms of the sheer versatility might be turquoise (but let us know your thoughts too), turned into fabulous jewelry by Native American tribes. But even enchanting turquoise, of the rapturous colors, is not suitable for carving or for shaping in quite the same way as amber is, nor does it share the astonishing array of color that is real amber. After beads there are countless natural forms used in earrings, pendants, rings- all the usual jewelry items & amulets. In literally every shape one can imagine. But amber can also be carved into art objects, such as chess pieces & small precious figurines of infinite variety. Then there are cameos- as endless as their possible subjects! Then there are the colors of amber cognac, cherry, green, light butterscotch, lemon, black, white, speckled, spotted, translucent, opaque… & everything in between! One may even find -very, very rarely- ambers laced with hues of blue or purple. It also seems that not only amber natur al, but amber itself seems obsessed with depicting natural forms. Not only the earthy, mysterious lumps, nuggets & geological shapes we expect to discover from raw amber, but a fanciful & seemingly neverending parade of amber animals is constantly expanding. And amber insects such as butterflies & dragonflies, bees & spiders are beloved motifs of amber artisans. Speaking of amber butterfly jewelry, we have added several new styles, some of which are just now back in stock due to popular demand after being sold out. 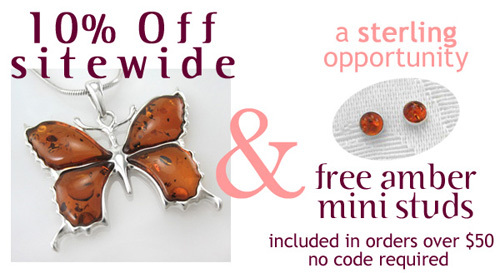 Now through Friday, June 29, 2007 take 10% off any purchase at Amberjewelry.com & if your purchase is over $50, we’ll include a pair of our best selling cognac colored amber & sterling silver mini stud earrings.